IBV affects the respiratory and urogenital tract in infected birds. Birds of all ages are susceptible to infection but the clinical signs may vary. The first recognized and most conspicuous signs are the respiratory signs, hence the name Infectious Bronchitis. 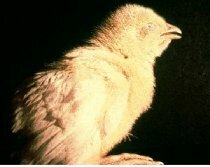 However, the pathogenicity of the virus for the oviduct in very young chicks or birds in production is often more important. The kidneys may also be affected. Young chickens are depressed and huddle under the heat source. Respiratory signs &dash; gasping, coughing, tracheal rales and nasal discharge. Birds in lay have a marked drop in egg production and an increased number of poor quality eggs may be produced. 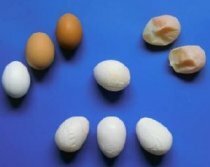 The external and internal quality of the eggs may be affected, resulting in misshapen or soft&dash;shelled eggs with watery content. The hatchability rate of the eggs may be affected. When the kidneys are affected, increased water intake, depression, scouring and wet litter are commonly observed. Comparison of normal eggs &lpar;above, left&rpar; with shell-less eggs &lpar;above, right&rpar;, rough-shelled egg &lpar;centrer, and misshapen eggs &lpar;bottom&rpar; laid by hens during an outbreak of IB. Young chicken showing respiratory signs. In the graphs below it can be seen how an IB infection of layers and breeders causes egg production losses and poor quality eggs in unprotected birds. The graph displays how an IB infection of layers and breeders causes egg production losses in unprotected birds. The graph displays how an IB infection of layers and breeders causes poor quality eggs in unprotected birds.